Real Madrid lost back-to-back games for the first time since November 2015 as Celta Vigo edged the first leg of their Copa del Rey quarter-final. 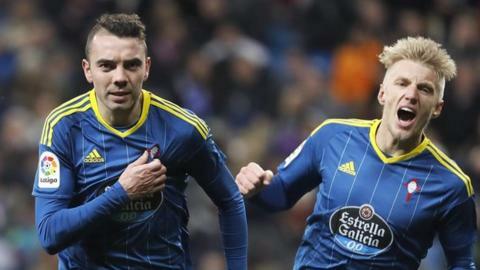 Madrid, whose 40-game unbeaten run was ended by Sevilla on Sunday, fell behind when ex-Liverpool forward Iago Aspas drilled in his 16th goal of the season. The home side levelled at the Bernabeu when Marcelo buried a thunderous left-foot volley from the edge of the area. But Jonny regained Celta's lead seconds later after a quick counter attack. Madrid still had time for France striker Karim Benzema to blaze a bouncing ball over the crossbar from close range with eight minutes left. It means the visitors, who are eighth in La Liga, take a slender lead back to Galicia for next Wednesday's return leg. Zinedine Zidane's side only lost twice in their previous 48 matches across all competitions.